Oh my goodness this verse. Today and every moment of every day. So often our thoughts can get the best of us…leading us far away from the thoughts the Lord would want us to have, far away from peace and joy and sometimes straight into temptation and sin. I know sometimes I will rehash conversations that have already taken place thinking of what I should’ve said or shouldn’t have said…occasionally I might speculate or make assumptions about what others are thinking or question their motives…often I think about future events that more than likely will never even take place which causes unnecessary anxiety, worry, etc… What a waste of time and energy, right!? These thoughts and those like them are not from God or of God! It’s important to recognize what’s going on in our minds. When impure, false, wrong thoughts enter into our brains we must nip them in the bud before they reach our hearts and souls, taking root. 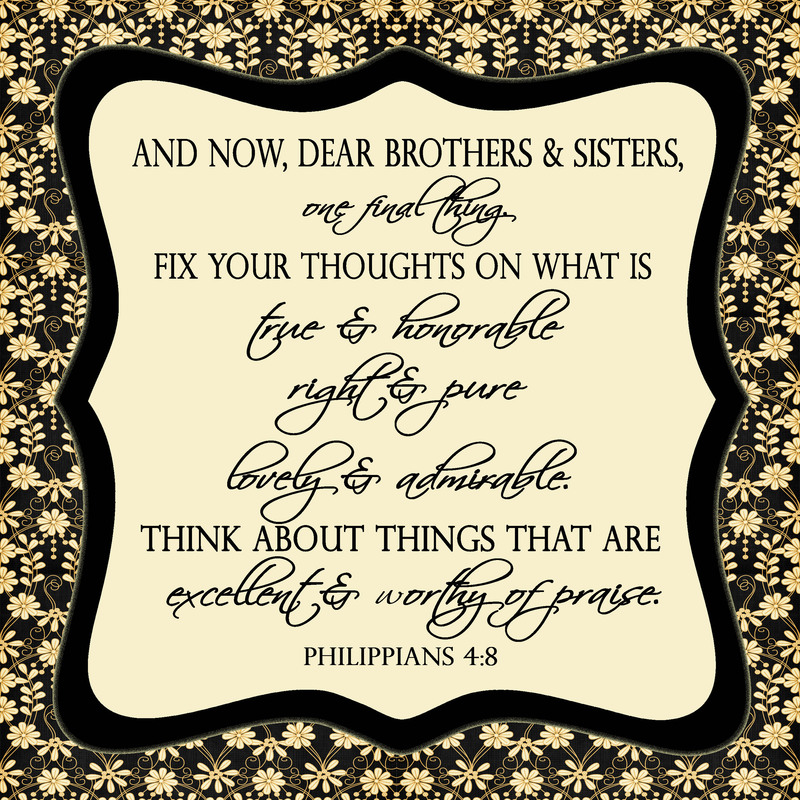 Memorizing and mediating on Philippians 4:8 is an awesome place to start. It’s also important to remember that God is the God of peace, not chaos; He’s the author and perfector of our faith, not our fears; He is truth and in Him are no lies, assumptions or speculations. If He is the Lord of our life, is He the Lord of our thoughts? My daughter went through a time when she would tell me when she was thinking a bad thought (normally having to do with monsters under her bed or things in the dark- oh to be a child again!). I would ask her if what she was thinking was from God, the answer always being “no”. We then would shift our focus to the things of God, that which is TRUE and that which brings peace and joy, not fear. We would talk about His beautiful creation, our thankfulness for the day and we would pray for her thoughts to be from Him. We would also occasionally sing, this coming from some awesome advice left behind by my Nana. So what’s going on in your head today? Is it true? Honorable? Right? Pure? Worthy of your time to even be thinking about?? Is it time to give those thoughts to Jesus and ask Him to renew your mind? Is it time to start singing?? Captivate our thoughts Lord! Own them! Make them of you, not of what we speculate, don’t know and can’t control. Our minds are weak, Lord, may we fill them up with You. May our thoughts be governed by Your Spirit and not by our flesh. May they be pure and full of grace for others and ourselves. You know our thoughts and you love us anyway~ and that is something worthy of our praise. In Jesus’ name, AMEN! ~If you are looking for further help with your thoughts, Me, Myself and Lies is an awesome DVD driven bible study by Jennifer Rothschild that is all about what is in our “thought closet.” It’s full of scripture and Godly wisdom about transforming our thoughts. I highly recommend it for yourself or a small group study!